I love Charlie Brown specials on TV. I watch them whenever I can. One in particular that I love is It’s the Great Pumpkin, Charlie Brown. The Great Pumpkin seems to be known only to Linus who waits for him every year on Halloween. Linus and his blanket wait patiently in the pumpkin patch for the Great Pumpkin to appear. Invariably he fails to show up and a humiliated but undefeated Linus vows to wait for him again the following Halloween. A line made famous by the TV special is “There are three things I have learned never to discuss with people: religion, politics, and the Great Pumpkin” Well, I pretty much adhere to that rule, too, but seeing that Halloween has just passed, today is election day, and I baked pumpkin scones, I’m breaking the rule to share with you this recipe for awesome pumpkin scones. I imagine Linus would have loved to have one while he waited for the Great Pumpkin, but you don’t have to wait that long, only long enough to whip these up and have one while it’s still warm with a cup of coffee or tea. In place of the half and half you can use 3/4 cup fat-free buttermilk, plus add 1/2 tsp. baking soda to the dry ingredients. 1. Preheat oven to 400*F. Line a baking sheet with parchment paper. 2. In the bowl of a food processor, add the flour, sugar, baking powder, and pumpkin pie spice, and pulse to blend briefly. Add the orange zest and better and pulse on and off. until the mixture has the consistency of fine meal. Transfer flour mixture to a large bowl. Transfer to a large mixing bowl and stir in the pumpkin and half and half, mixing just until combined. Mixing in the pumpkin and half-and-half. 3. Spoon the dough onto the baking sheet, using 1/4 cup measure or large spoon, to divide evenly. This should make about 10 scones. (I got 11.) Space them about 1 inch apart. Space about 1-inch apart on parchment lined baking sheet. Brush the tops with a tablespoon or two of fat-free half and half. Bake for 12 – 15 minutes or until they are lightly browned. 4. For the glaze: Add powdered sugar, pumpkin pie spice and water to a small ;bowl. Whisk together well. Drizzle over scones and serve warm or cold. Light and tender. Just right for a snack. Knowing what to eat for breakfast when you are dancing in a competition is difficult. It’s important to eat foods for energy, but equally important to avoid foods that will make you feel full or sluggish. In any hotel a full breakfast is always available, but it is not my habit to partake of them. Instead I usually bring along simple foods that I can eat quickly with some coffee while I am getting ready. These scones were the ones I made to take along on my trip. They met my requirements for easy to eat, nutritious, low in fat, and a good source of energy. Most scones fall into one of two categories: the English version which is very dry and crumbly, a platform for slathering on jam and clotted cream; or the Americanized version that folds the cream directly into the batter, along with a hefty measure of butter and sugar. Either way you’re starting your day with about 500 calories, and that’s way too much for me. So I was on the hunt for a recipe for a lightened up scone that would still provide a fruity, whole-grain, buttery biscuit. I found it in this recipe. The key is part-skim ricotta cheese. It has a richness similar to that of whipping cream with a fraction of the fat. Whole wheat pastry flour is worked in, and some of the butter is replaced by heart-healthy canola oil for scones that bake up light and fluffy. Dried cherries are plumped up in orange juice for a flavor boost, and nutty almonds add crunch. If you wish you can use half the ricotta, whipped with vanilla and citrus zest, to dollop on the freshly baked scones in place of clotted cream or butter. I felt that having one of these crumbly, cake-like biscuits early in the day got me off to a good start. 1. Preheat oven to 425*F. Line a baking sheet with parchment paper. Combine sugar, vanilla and orange zest with ricotta cheese. 4. Weigh or lightly spoon flours into dry measuring cups; level with a knife. Combine flours, remaining 3 tablespoons sugar, baking powder, and salt in a large bowl; cut in butter with a pastry blender or 2 knives until mixture resembles coarse meal. Add cherries and almonds; toss. Add buttermilk mixture; stir just until combined. 5. Drop dough by 1/4 cupfuls 3-inches apart onto the prepared baking sheet. Combine egg and remaining 1 tablespoon buttermilk, stirring with a whisk. Gently brush top and sides of dough with egg mixture. Brush tops with buttermilk-egg mixture. Bake at 425*F. for 15 to 16 minutes or until golden. Remove from the pan and cool slightly on a wire rack before serving. As a finale to this recipe, I’m including here the photos I’ve been waiting for that show me dancing rhythm dances. This costume has a lot of fringe that moves with the dancing, and shows the judges that you are using your hips correctly. This will be the end of my show and tell about the competition, I promise. As I’m sure you know by now I really love scones. I’ve never eaten a scone I didn’t like, but if they include dried fruits or ginger that scone and I will be friends for life. So this particular recipe had me at “candied orange” and when you add golden raisins and then soak all that in orange liqueur overnight before baking, then let me tell you these are the best scones imaginable. They become crisp and golden with a light, flaky interior. The fruit offers a slightly chewy contrast. Orange zest and Grand Marnier, or any orange flavor liqueur, flavor the scones. Slather them with butter and enjoy with a cup of coffee or tea for breakfast. But really they could be dessert. The other aspect of this recipe that got me was the total yield is around 15 or 16 scones. So you can bake once, and freeze half of them to enjoy at a later date. These scones keep for 2-3 days in an air-tight container at room temperature. 1. Stir together candied orange peel, raisins, orange zest and liqueur in a small bowl. Cover with plastic wrap and refrigerate for 1 day. 2. Preheat oven to 350*F. Whisk flours together in a large bowl. Transfer half to a processor and add butter. Pulse to cut in butter (the largest pieces should be the size of small peas.) Add granulated sugar, baking powder, and 1 teaspoon salt to remaining flour in bowl; whisk to combine. With pastry blender or your fingertips, work in the flour-butter mixture until mixture resembles coarse meal. 3. Whisk together cream, whole egg, and egg yolk. Make a well in the center of flour mixture, and pour in half of cream mixture. Draw dry ingredients over wet ingredients with a rubber spatula, scraping bottom of bowl to incorporate all dry crumbs. Add remaining cream mixture, and gently mix just until incorporated–do not overwork dough. 4. Turn out dough onto a lightly floured work surface, and press dough into a 6-by-9-inch rectangle. Sprinkle dried fruit mixture evenly over dough. With a short side facing you, fold rectangle into thirds, as you would a letter. Rotate dough a quarter-turn clockwise. Roll out dough to a 6-by-9-inch rectangle, folding and rotating once more. 5. Pat dough into a 1 1/4-inch-thick rectangle with floured hands, and cut out as many rounds as possible with a floured 2-inch round biscuit cutter. Gather scraps, reroll once, and cut out more rounds ( you should have a total of 16). Note: In order to avoid rerolling scraps and cutting twice, I rolled my dough out to approximately 6-inch-by-10-inch rectangle, then with a sharp knife cut out 2″ squares, getting a total of 15. 6. 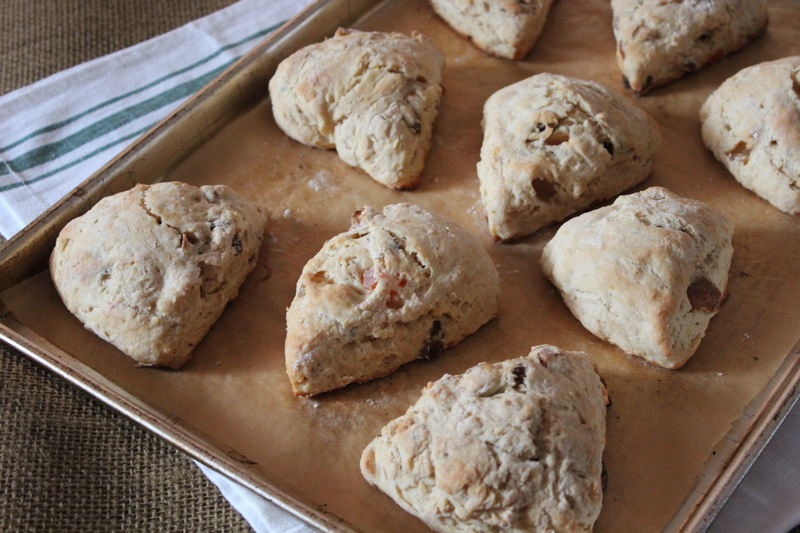 Place scones 2 inches apart on parchment-lined baking sheets. Lightly beat egg white and brush tops; sprinkle with sanding sugar. Bake until golden brown, about 25 minutes, rotating sheets halfway through. Let cool on sheets. Serve warm or at room temperature. Fresh from the oven and smelling delicious. Today I just had to bake something. It didn’t have to be sweet; I simply wanted something hot and flaky fresh out of the oven. I rationalized that if there was no sugar in it, made with part whole wheat flour, and included honey and dates, how could it possibly be bad for me. And also because they contain the herb thyme, these scones are technically savory, not sweet. I will have one when they come out of the oven, the rest will be saved for breakfast(s). I don’t know why I’m obsessing so much about this and feeling guilty, the weight is coming off as planned, but I don’t want to hit a plateau and then say to myself, “that’s because you ate the scones”. Guess I’ll just have to chance it, because the aroma of these scones baking makes them too good to pass up. Soooo, if you’re on a diet journey like I am and you’re craving something really good, but also good, i.e.. healthy, for you, give these a try. And try not to feel guilty! **In place of self-rising flour, use 3 cups regular all-purpose flour, plus 1 Tbsp. baking powder and 1/4 tsp. salt. I used half white flour and half whole wheat flour, i.e. 1 1/2 cups of each. 1. Grease 2 baking sheets or line with parchment paper. Preheat oven to 350*F.
2. Measure out flour in a large bowl. Cut in butter with a pastry cutter till coarse crumbs form. Stir in thyme leaves. 3. In a smaller bowl combine milk and honey and stir with a whisk to blend well. 4. Add liquid ingredients to dry and mix lightly, do not over mix. If the dough remains shaggy and doesn’t come together add a drizzle of milk until it just holds together. Stir in the dates. 5. Turn out onto a floured board and knead 2 -3 times. Roll out to 1 -inch thickness. Roll out to about 1-inch thickness. Cut out with a 3 – inch biscuit cutter and place onto prepared baking sheets. 6. Brush the tops of scones with a little milk or cream and lay a small sprig of thyme on top of each one. Cut out with biscuit cutter. Brush tops with milk, and garnish with sprig of thyme. Bake for 20 – 25 minutes at 350*. My scones were perfectly baked at 20 minutes. Browned and flaky, fresh out of the oven. Serve warm with a little butter to melt into all the crevices.